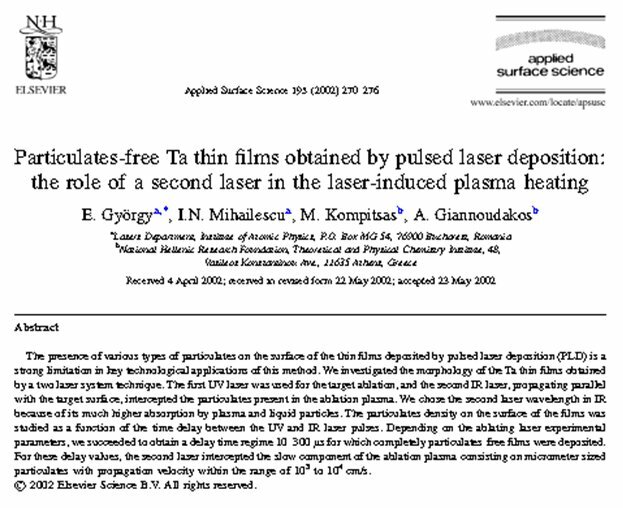 (1) The (as-deposited) films show a semiconducting behavior (p- or n-type semiconductivity). 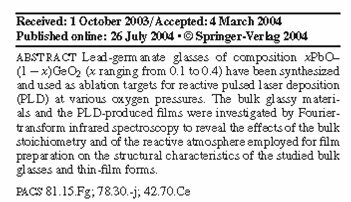 (2) They are characterized by a broad (several eV) band gap and therefore show a good transparency in the IR, VIS and near UV spectral range. 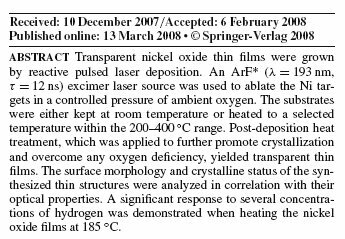 (3) Both properties above can be changed in broad ranges by an appropriate selection of the deposition conditions (substrate temperature and ambient gas pressure). 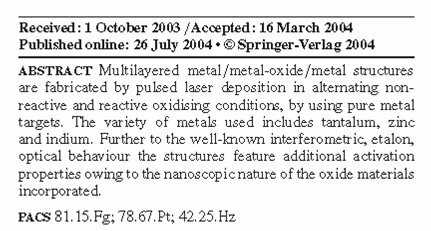 In particular, even the conductivity type can be changed under a special selection of the deposition conditions. 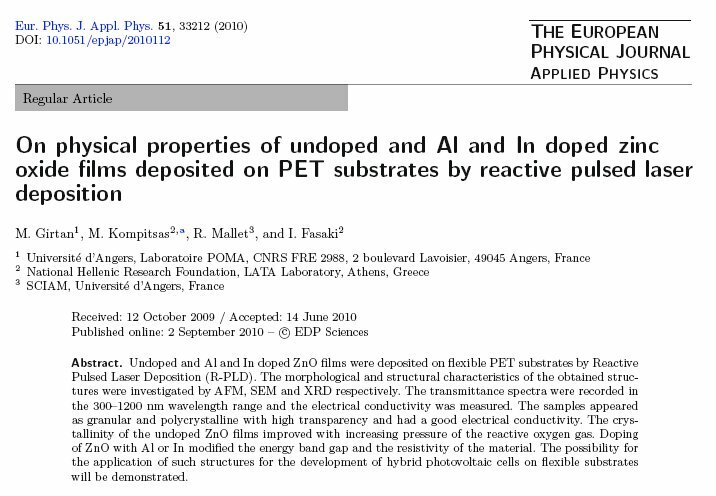 (4) The MOs when doped with atoms of the Fe group may show ferromagnetic properties with a high Tc. 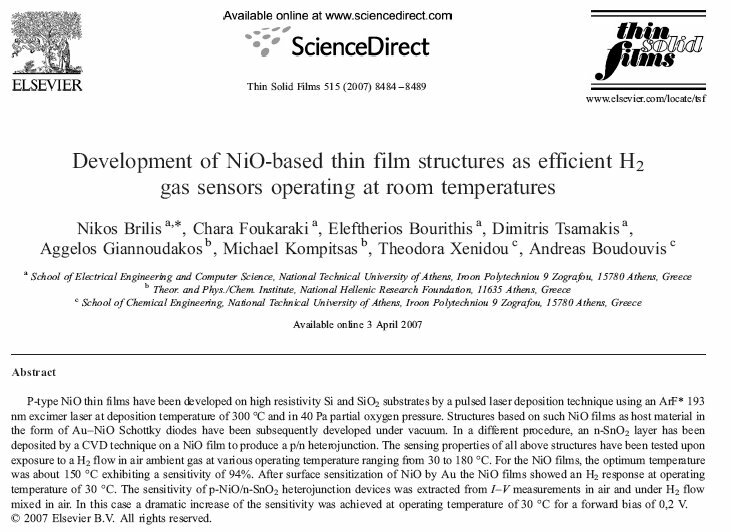 All above properties have led to a broad range of applications of the MO thin films, ranging from optoelectronic ones, toxic gas sensor development, solar cells and spintronics. 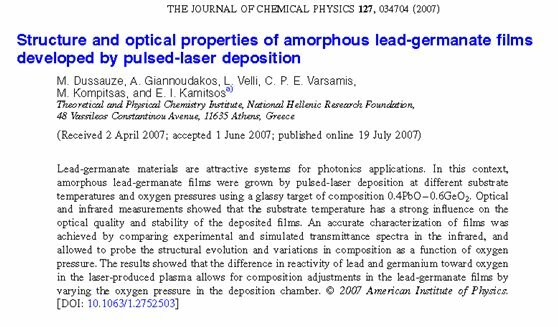 A further advantage of the MO growth is that the contamination of the deposition chamber is avoided. 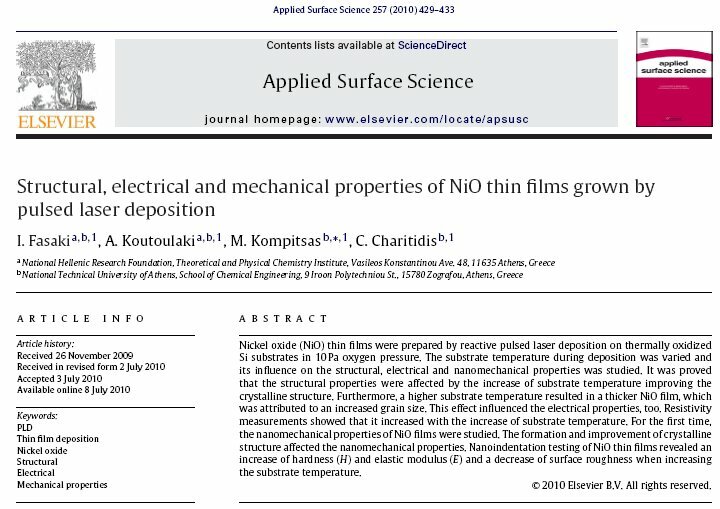 Therefore, one can switch from one kind of MO to another without long cleaning and pumping down times that may lead to long periods of inactivity. 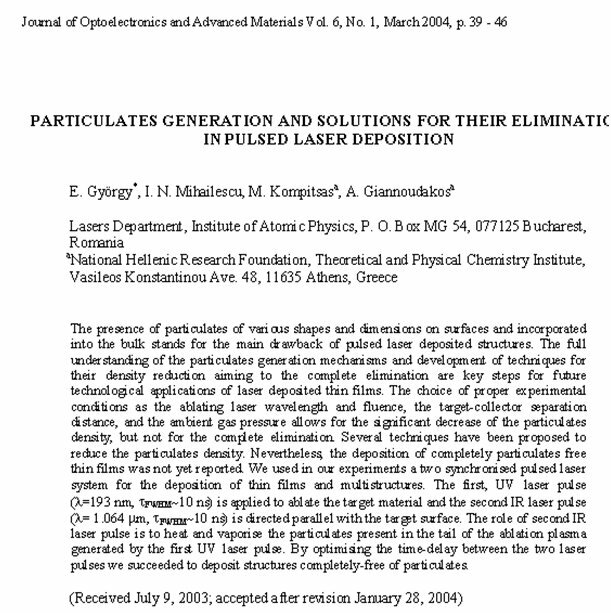 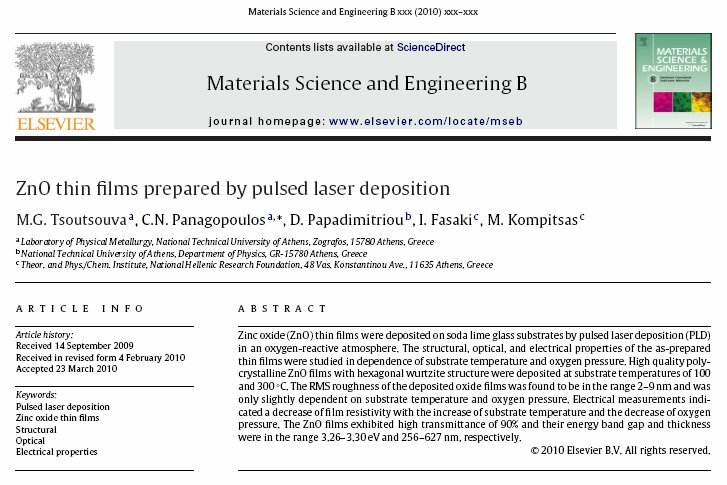 (1) Particulates reduction on the surface of the deposited thin films by a second reheating IR laser. 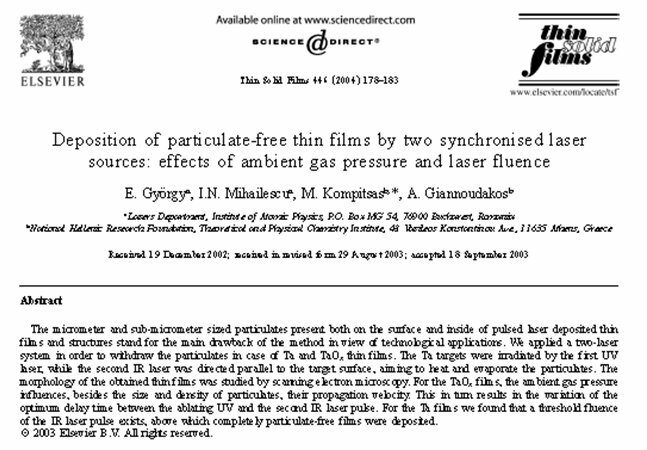 Application shown on Ta and TaOx thin films. 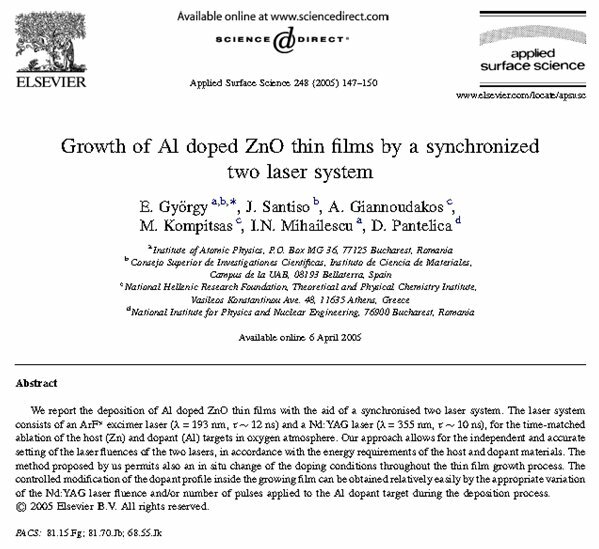 (2) Controlled doping of Al into a ZnO matrix using the 2 L/2T-PLD technique. 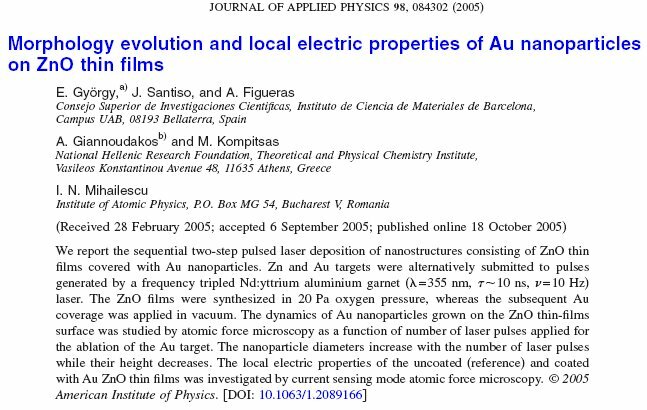 (3) Morphology evolution of Au nanoparticles and their properties on ZnO thin films. 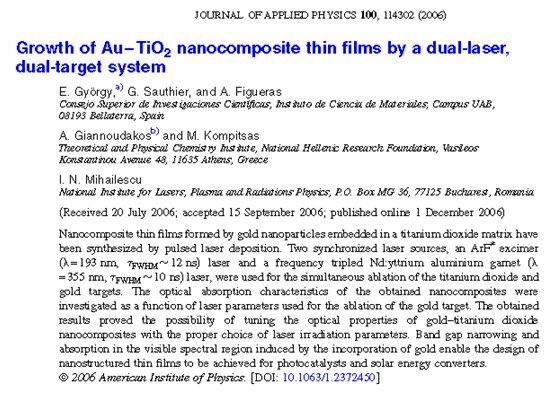 (4) Tuning the properties of Au-TiO2 nanocomposite thin films by the 2L/2T-PLD technique. 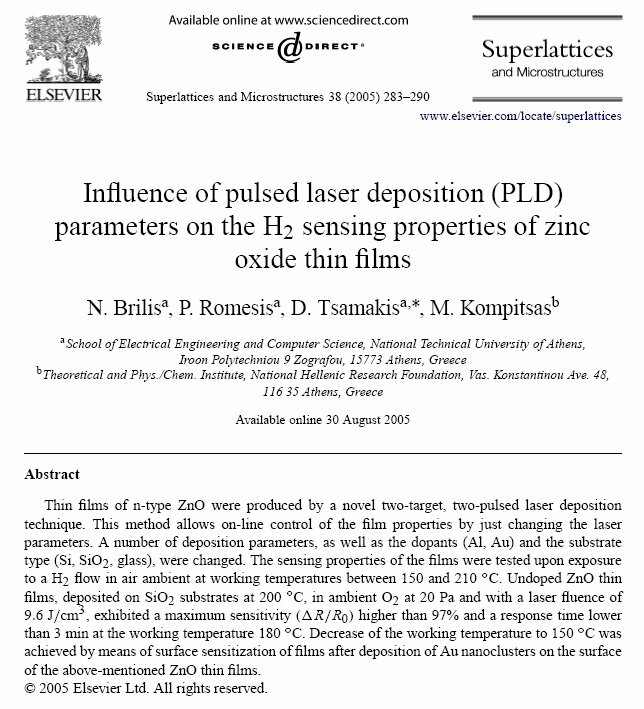 (5) Influence of PLD deposition parameters on the H2 sensing of ZnO thin films. 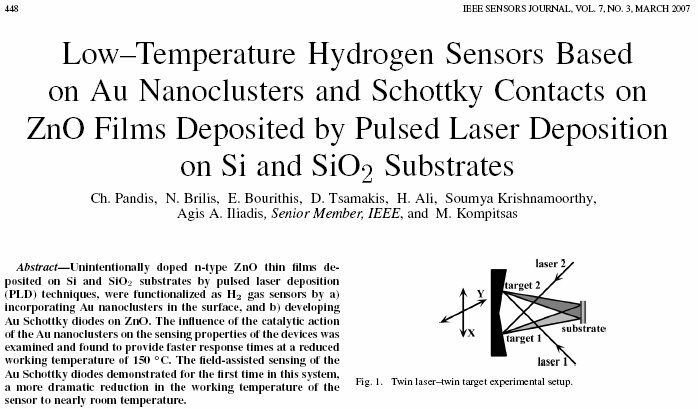 (6) Au nanoclusters and Schottky contacts on ZnO and NiO thin films for low operating temperature H2 sensors. 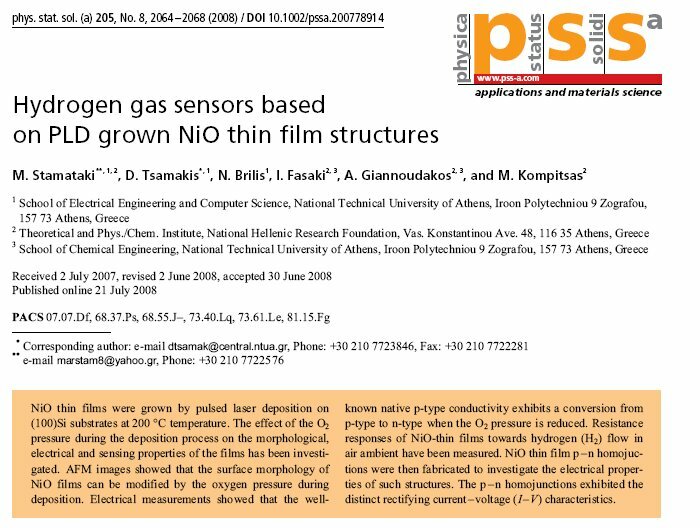 (7) NiO-based structures grown by PLD as H2 sensors. 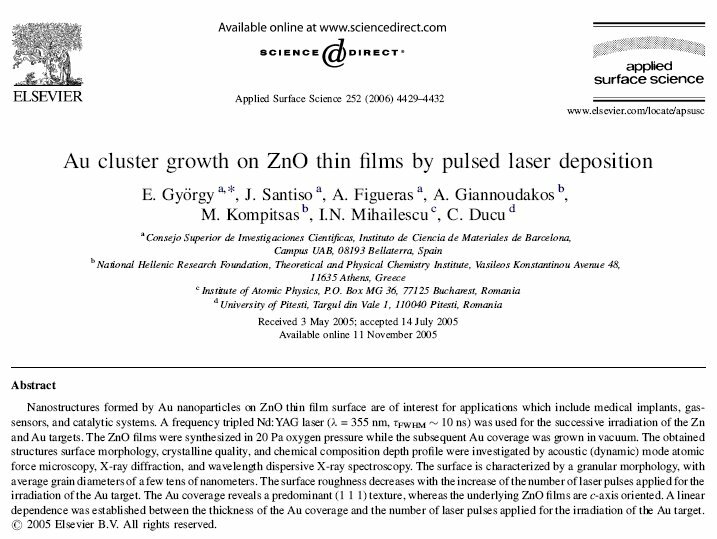 (8) Copper oxide thin films deposited by PLD for CH4 sensing. 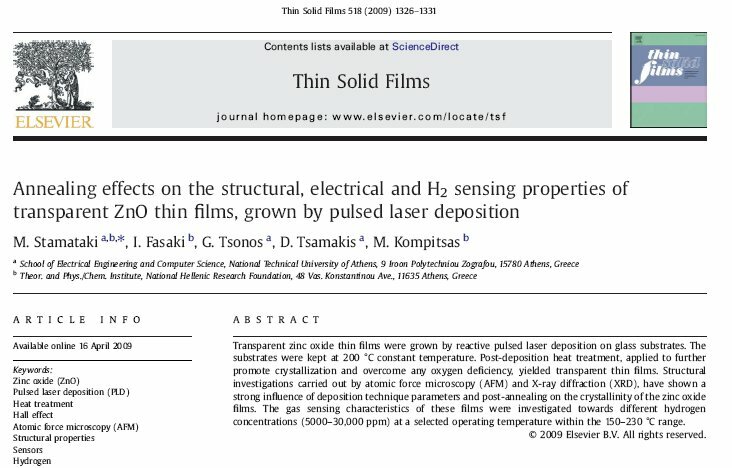 (9) Metal/Metal oxide/Metal etalon-type thin film structures grown by PLD. 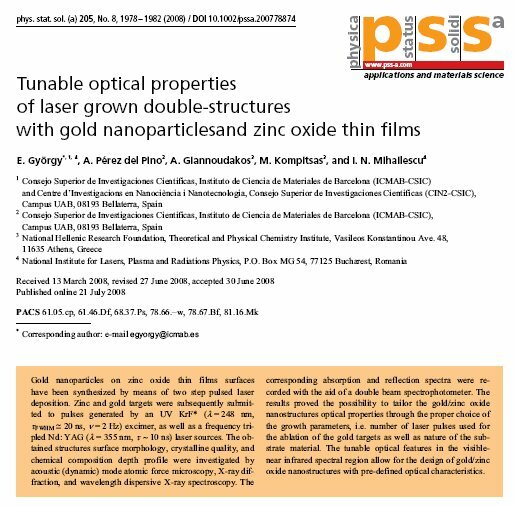 (10) Properties of amorphous PbxGe1-xO2 thin films grown by PLD. 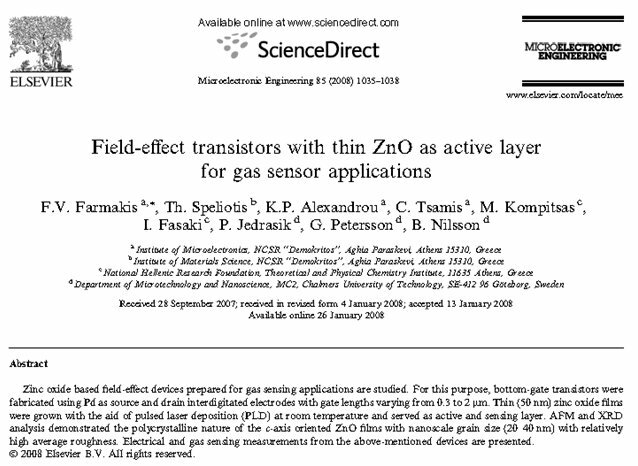 (11) A FET with a ZnO thin film as active layer for NO sensing. 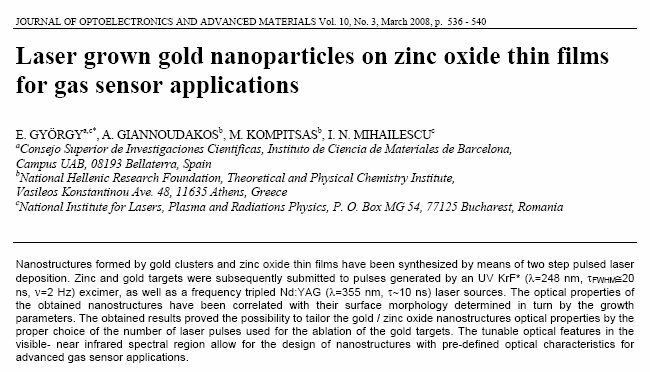 ZnO thin films as electrodes for photovoltaic applications.